Have you ever thought there would be any scenario in which you would willingly sit in standstill traffic for a while? No? Well, allow this adorable viral video to change your mind. 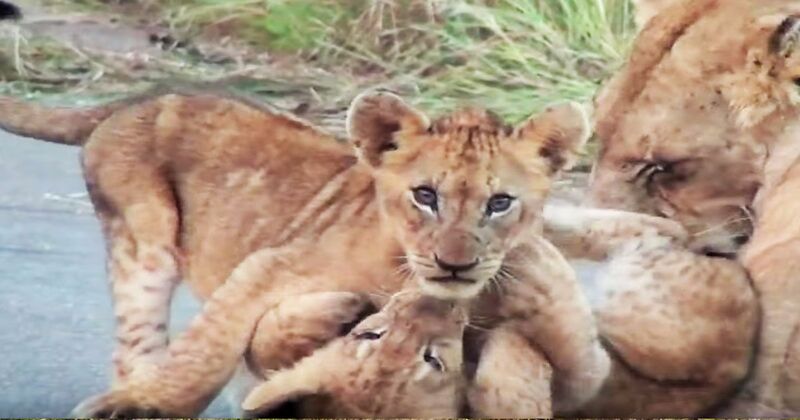 Witness the cute as these lion cubs roughhouse and roll around...right in the middle of the road. Totally oblivious to the cars stopped on either side, they’re just having a great time. As the narrator points out, they slept on the asphalt overnight because it was warm. In the wild, lions fur responds to the temperature of the climate, they’re in. As Field Museum explains, researchers have finally linked the density of the fur to the warmth or cold of a climate, including the lion’s mane! When it gets colder, the lions begin to grow thicker fur, and when it heats up, the fur thins out. It’s the same for the lion’s mane, which is used to attract females – the more impressive, the better. However, sleeping at night (as shown in the video) is actually pretty rare for lions. In general, according to One Kind, they sleep during the day to avoid overexerting themselves in the heat and hunt at night when it’s cooler. They also have great night vision, making it easier for them to catch prey that can’t see as well in the dark. So, be honest: if this roadblock backed up your morning commute, would you really be mad? We didn’t think so! They’re just too cute to be mad at. But, share this video with your friends and ask them!